The Autofarm A5 from Gps-Ag continues to deliver the ultimate in vehicle control in a fresh new hardware package even more modular and portable than before. The A5 is stacked with technology to set you up for the future. Novariant are world leaders in the development of GPS technology. Their patented roof array models the motion of the tractor cab in three dimensions and delivers extraordinary performance without the need for gyros or tractor movement. 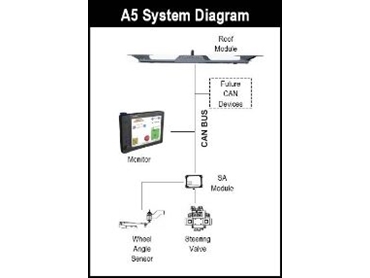 The AutoFarm A5 system features a standards-based architecture built using Controller Area Network (CAN) bus technology that opens up a world of compatibility with other manufacturers’ equipment. CAN bus is essentially a cable that distributes information between modular electronic components (user terminal, steering controllers, application rate devices, yield sensors, and other vehicle components) and it’s already widely used in farm machinery. AutoFarm employs a unique dual CAN bus design to ensure that high priority control data reaches critical electronics without delay. The AutoFarm can be moved from vehicle to vehicle with steering kits. All calibration data can be saved for each vehicle so within minutes you are operable. The AutoFarm will work on all types of tractors (wheel, track, articulated) and even work on harvesters to ensure maximum harvesting efficiency. With the A5 all you need to move is the user terminal and the quick release roof array, all the cables stay in place. 5. Maintain defined compaction zones. The AutoFarm 2cm is available in two models—single and dual frequency. Whilst in autosteer mode, the steering performance of the single and dual frequency AutoFarm is identical, the dual frequency, however, improves the GPS acquisition time when starting the AutoFarm. The dual frequency AutoFarm typically takes 2-5 minutes to survey whereas the single frequency AutoFarm takes between 10-20 minutes. The single frequency AutoFarm is currently available in the GPS5001 (cab box) model only. The AutoFarm Step One is an entry level to Autofarm precision vehicle control. It uses the same user terminal and hydraulic steer kit to the 2cm RTK model and a similar roof array, but instead of a base station you use DGPS from an external GPS receiver. This could be a receiver from a guidance system you already own. The Step one can later be upgraded to 2cm RTK using a base station. Step One is available in both GPS5001 (cab box) and A5 models. The AutoFarm enables less skilled operators to perform critical operations. Operating high capital items of machinery efficiently leads to cost savings in machinery rationalisation. The AutoFarm investment starts paying for itself from day one. The AutoFarm has no annual costs so the benefits of eliminating overlap and working equipment accurately day and night keep adding up – day after day. The AutoFarm can record accurate elevation data during normal farming operations. This data can be used by your leveling contractor or used with AutoLevel, an add-on to your AutoFarm that can control the height of a leveling bucket – another way AutoFarm owners can stay ahead of the competition. The Autofarm has no moving parts and is extremely reliable. It comes with a 12 month warranty is backed by local dealers and Australia's widest reaching network of dedicated GPS field staff.